This has a US map where you can click on your state for state specific info. This has blog radio programs and resources for families dealing with special needs issues. Has special needs equipment & products. The FREE Resource page of a special needs products company. Autism links from an organization that helps military families affected by autism. Getting help in Canada with autism issues. Many resources & info for people with autism & their families. This shows some organizations that help with autism needs in Michigan. Transition Timelines for people with Autism in Michigan. Many Christian writers share the joys & challenges of special needs parenting. For parents of special needs kids, a way to connect & find support. Parents share opinions on a number of topics of interest, including Transition! Encouragement & insight for parents of special needs kids. I’ve recently decided to check out the blog, ComfortInTheMidstOfChaos.com in the hope that I will find writings that speak to me where I am currently. This is a community of Christian Parents whose children have complex special needs. If you’ve read anything here at Special Connections you may guess why that sounds appealing. Because I’m basically still reeling from some very difficult, painful, unethical, and frankly illegal events surrounding my son’s education (or lack therof), I clicked on the “special education” tag at the above website. The article below jumped out sufficiently for me to write to the author in the comments section. Below are my comments as shared with the above blog post, though due to the character limit they were posted there in batches. We have just experienced the fallout of this dilemma first hand. Our 20 year old autistic (among many other issues) son “graduated” last Spring with a “diploma” though he still cannot do 3rd grade math! At the IEP near the end of the school year I (again) raised the issue of Transition Services and provided several “age appropriate transition assessments” to show areas where he still needed significant help. By the way, the school has done Zero Transition goals or services over the years even though I have asked in writing for such Legally Mandated services to be provided. They once again refused, and also refused to reconvene the IEP to address outstanding issues and my son’s need for clarification from IEP Team Members. The bottom line is that we ended up filing a Due Process Hearing Request near the end of 2015…and I had been working on the issues related to that filing leading up to the IEP and before filing, for about 8 months preceding it. We tried to find an attorney or legal advocate including returning to the University based “poverty law center” who had assisted us a decade ago when we had been compelled to file for Due Process, again as a last resort. The law center said no; our state’s Protection & Advocacy organization said our situation was too complex (after working with us over the phone and email for a month) so no; a state level Autism Organization did basically the same thing as P & A. Anyway, a relative offered us a sum of money that could enable us to “hire” legal advocacy for the filing of motions, oral arguments, and conducting the hearing itself. We visited this attorney’s office and he basically told us it would cost us at least $20,000 to have a lawyer see us through the Hearing, which of course (even with help) we didn’t have. The financial component of what would likely fall on our head if we proceeded, our direct attorney costs and the likelihood of being “sued” to pay for the school’s attorneys, regardless of the legitimacy of our issues really scared most of the other family members at the meeting. My husband was afraid that if we proceeded we could lose our house (though not having $20,000 meant, apparently, not proceeding at all)! So instead of helping us with our case “our” attorney (who at least lowered his fee) appeared to never read our actual hearing request (it was nearly 40 pages long after all), nor did he review some of the supporting documentation I sent him electronically to show “proof” of what was being contended, nor to offer us any advice or analysis on the “merits” of our case, or lack thereof. Needless to say I was, and basically still am, furious. I felt as if the 15 plus years of Wrightslaw and other advocacy training and self education I’ve attained was pointless. I could have rolled over and played dead at virtually every IEP meeting we’ve had and gotten virtually the same results! The upshot was that our disabled son was pressured to sign a “with prejudice” dismissal of the case request so that the case would just go away…and we were all supposed to be grateful that at least the school wouldn’t try to make us pay for their lawyers! How is that protecting the rights of the disabled, especially the lower income disabled (& their families)? We had and still have extremely serious and legitimate issues, many of which have been problematic for years, some going back to 2001 when the school disregarded autism and outside (hospital based) neuropsych testing showing my son’s IQ to be “low normal” and they decided he had an IQ 30-40 points lower than the outside testing showed…put him in a class for mentally/cognitively impaired students, didn’t address his autism, denied him access to general ed in any meaningful way until our prior hearing request (which finally got him a Para Pro, which had been a doctor’s written recommendation from at least 2000), refused to re-mediate his areas of learning disabilities because they preferred to use their significantly lower iQ during the “severe discrepancy” LD era, even though his math LD met that more stringent requirement even considering the IQ they claimed he had…and many other things. I could go on at even greater length here, and I’m sorry for going into this so much, but it is still very fresh and raw. In fact, today was to be the day the Hearing was to have happened/started. At this point I’m trying to regroup to find another way to get my son’s significant needs addressed when a system tasked with caring for these issues was extremely derelict in its duties. Given that Michigan is usually quite generous, in that it provides Special Education through age 26 (unless one “graduates”) it is even more frustrating. My son’s doctor has said that kids that have high-functioning autism are the one who aren’t getting their needs met, not in school and definitely not in the adult services industry. If you are high enough functioning to handle the academics then they apparently completely disregard the independent living skills side of the equation. If you can’t handle the academics then the “life skills” track means you never acquire anything like a high school education. If you examine the IDEA requirements for post-secondary transition you have to wonder where the “diploma” track kids will get those issues addressed if they are busy taking the course requirements for graduation…and graduating kids without high school skills and no transition services violates the letter & spirit of IDEA! Here’s our bottom line, too weary over the years to step our issues up to the next level after the extreme exhaustion and years of dispute that accompanied our first Due Process request (that took like 2 years to resolve, when 60 days is “required”)…overwhelmed by Brain Tumor & Liver Transplant issues that exactly overlaid the years when Transition should have been addressed (and initially when we should have confirmed that the Settlement terms from the first Due Process request were followed–they weren’t entirely). Being lied to by school staff that you don’t get functional needs met when you’re on the diploma track and being too beaten down by the IEP process (always backed up to the end of the school year so there’s no maneuverability for “procedural safeguards”) to start the battle all over again when school starts. Being unable to find virtually Any Advocacy to assist us over the years so living with the “as good as it gets” aspect of the IEP that was, from my perspective, No Good At All (and Never Legally Compliant ANY Year). When finally filing Due Process again, as a last resort, being told that because you don’t have deep enough pockets to absorb attorney fees for your son AND the school you can’t/mustn’t proceed. We are praying about where to go from here, but it is an incredible heartache to me that we cannot even, apparently, have our legitimate issues heard nor obviously afford to find someone to proceed. Now it may be that even if we found someone free who could proceed we cannot carry on because of the “with prejudice” dismissal (which apparently means cannot be brought up again and is used to dismiss a case on the merits–which were never addressed in any venue, not even our alleged “legal representative”). Being told by the attorney that if we’d come to him a year ago he could have “kicked them in the…” but now it’s basically too late. “You can’t do anything to help your son…but I really hope you’ll become an advocate to help others…you know the special ed law better than the administrative law judge who would have decided your case”…what does a parent even say to news like that? Thanks for letting me vent, and thanks for writing about the many issues families face. I only just found your blog after reading your recent article on Rare Diseases and Not Being Alone that you published through Special Needs Parenting. I am planning to read many of your postings in my process of moving forward from this devastating disappointment. PS I recently started blogging at SpecialConnections@WordPress.com and would love to have you stop by! Best Regards! I have not yet, until this reply, written about so many of the details of what has transpired surrounding our Due Process Hearing Request and the horrible and entirely ineffective results from attempting to assert my son’s legal protections. If you are reading this page our family would greatly appreciate your prayers on our behalf as we seek to find a way to move forward that addresses our son’s myriad needs, redresses existing grievances (if that is even possible now), and hopefully ultimately blazes a trail so other students and families won’t have to suffer the major setbacks that have been body blows to us all. So much of what the author (Pensive Aspie in the below article) discusses is exactly representative of where we are currently in trying to get the needs of our 20 year old high functioning Atypically Autistic son the vital and necessary supports to help him attain an eventual measure of independence. There was a virtual absolute fail by Special Education in nearly every aspect of autism intervention (be it early childhood & intensive therapies & programs to high school “peer buddies” and other “inclusive” autism focused efforts) and I’m still regrouping from the virtual blackmail assault on our family for even attempting to address/redress grievances via the “protections” of special education “due process”. We live in Michigan where the special education services are generous…as in they can go through age 26…that is unless you “graduate” as my son recently did (without the capacity to complete 3rd grade math and with Zero Legally MANDATED Transition Services–to prepare special ed students for life beyond High School in arenas of education, employment, and independent living). Given this author’s experiences in Florida and my cousin’s experiences in Arkansas with her autistic son who also “graduated” this year when she later discovered that his reading and math skills were basically at an elementary level…it appears that we have a National Crisis and Epidemic of Not Addressing the Myriad and Complex needs of so many people on the Autism Spectrum. Autism only occurs in children. Because it is a childhood disorder, as an autistic child leaves adolescence behind, the symptoms of their autism will gradually decrease and disappear. 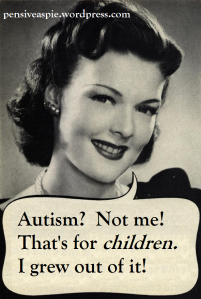 By the time the person is an adult, they will be completely Autism-free. They will have no need for speech or physical therapy. No need for mental health services. They will be fully functioning adults – ready to get a job, go to college and begin their new life without autism.